PostgreSQL supports two types of timestamps, one with and one without time zone. Contrary to what the name suggests, timestamp with time zone does not store the time zone. The difference between the two types lies in the semantics and is often a source of confusion. In order to understand the difference between the two timestamp types, one needs have a basic understanding of time zones. At least for me, this helped in making sense of the difference. Thus, I’ll first take a short detour and talk a bit about time and time zones before diving into times in PostgreSQL. Feel free to jump directly to another section. Time is the indefinite continued progression of existence and events that occur in apparently irreversible succession from the past through the present to the future. I like to think of time as a continuous timeline representing the absolute notion of time. What does absolute mean in this context? I’ll try to explain it with an example. When daylight saving changes from summer to winter time it causes the clock to be set back by one hour^1. We gain an additional hour on this day. Since we don’t have clocks with 25 hours, a certain hour (usually the third) is repeated, i.e., the clock will show 2:45 twice on this day. Does that mean we traveled back in time? Of course not! Time steadily progresses along the continuous timeline. The only thing that changed is how the absolute time is mapped to the time we read on a clock, also known as wall time. We keep track of the absolute time in a special time zone called Coordinated Universal Time, or short UTC. It does not observe daylight saving time and thus can represent the continuous notion of time. We can denote other time zones by offsets to UTC, such as +02:00 or -10:30. Further, there are named time zones like America/New_York or Europe/Berlin. Each such named time zone defines a set of rules denoting which UTC offset applies at any given moment in time. These rules for instance encode daylight saving periods or historical adjustments of the time zone. One further detail for Switzerland, which is probably out of scope for most users of tzdata: The Europe/Zurich zone describes all of Switzerland correctly, with the exception of the Canton de Genève (Geneva, Genf). Between 1848 and 1894 Geneva did not follow Bern Mean Time but kept its own local mean time. To represent this, an extra zone would be needed. To summarize, we can think of time zones as functions that uniquely map absolute time to local time, i.e. the wall time. The same goes the other way around. Knowing the time zone, we can convert any wall time to an absolute time, i.e. UTC. There is one caveat: certain wall times don’t uniquely map to an absolute time, they’re ambiguous. We can see this in the graph above where, for time zone B, certain y-values have multiple x-values. 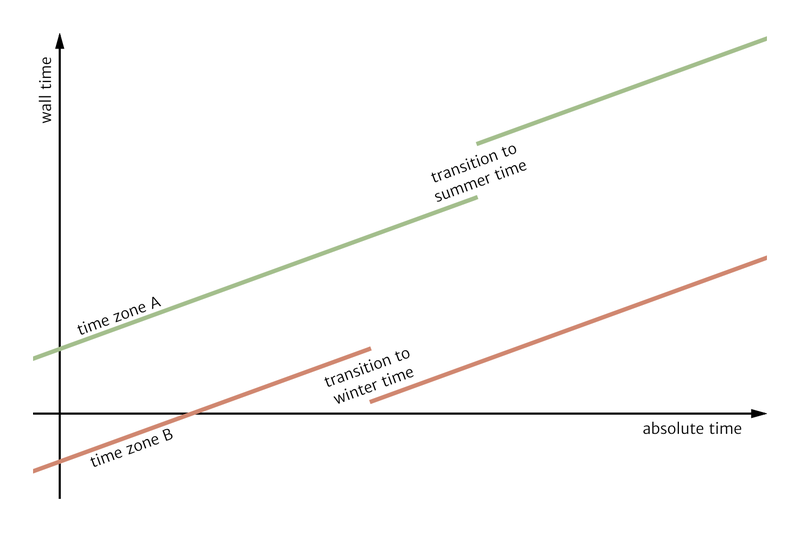 This is the case when transitioning to winter time where a determined hour is repeated. The two timestamp types available in PostgreSQL are timestamp without time zone and timestamp with time zone. For brevity’s sake, I’ll be using their shorthand versions timestamp and timestamptz. I’ve started using PostgreSQL through an ORM, specifically Active Record, the built-in ORM in Ruby on Rails. Active Record takes care of converting a timestamp from the application’s time zone to UTC before storing it in the DB. It is generally considered a good practice to store timestamps in UTC, otherwise you’ll run into problems related to daylight saving changes. Active Record uses timestamp columns to store timestamps. Hmm, that was not what I expected. Why didn’t it return 2016-01-01 00:00+10 as I had input? Clearly, the time zone +10 is not being stored. Instead, it is converting it to my computer’s local time zone Europe/Zurich. All timezone-aware dates and times are stored internally in UTC. [Timezone-aware dates and times] are converted to local time in the zone specified by the TimeZone configuration parameter before being displayed to the client. You might be asking yourself, what is the point of having an additional timestamp type if it is stored the same way? The answer is semantics. Whenever you encounter a timestamptz, you know it denotes absolute time. It was stored in UTC. However, when you come across timestamp, you can’t possibly know in what time zone the timestamp is just by looking at it. It is merely a wall time. Maybe it’s UTC, or maybe the developer stored it in local time. Without additional context, you can’t be sure. Hence, we should always be using timestamptz whenever we denote an absolute point in time. In this section I’ll show various things that can be done with timestamps in PostgreSQL. We’ll assume a default timezone configuration of UTC in the examples. Whenever I connect to a remote database and look at timestamps, I have to mentally translate them from UTC to my local time zone in order to find out how long ago something happened. I’m based in Zurich, which has a UTC offset of one or two hours, depending on the time of year, further complicating things. and all timestamptz values will be printed in my time zone. I don’t have to do the mental mapping anymore. The first example had no designator, thus the timestamp is parsed as US/Pacific, internally converted to UTC, and then converted back to US/Pacific for display. The second example had an explicit time zone, namely Z denoting UTC. There are two ways of converting a timestamp to another time zone. One is using an expression, the other a function. The function timezone(zone, timestamp) is equivalent to the SQL-conforming construct timestamp AT TIME ZONE zone. We get the wall time in California for 2016-01-01 00:00 UTC. Note that we passed the timestamp as a string, which was implicitly cast to a timestamptz. Since no explicit time zone information was contained in it, it was parsed in the time zone set by the timezone config (UTC in this case). Generally it is better to be explicit by specifying a time zone offset and by manually type casting, i.e., by writing ʼ2016-01-01 00:00Zʼ::timestamptz. What happens when we instead cast the string to a timestamp? Rather than subtracting 8 hours, as it did in the previous example, it surprisingly added 8 hours. Let’s look a bit closer at the output to understand what is going on. In the first example, where we passed a timestamptz to the conversion function, the return value was 2015-12-31 16:00:00. In the second example, we passed a timestamp to the function, which gave us 2016-01-01 08:00:00+00. Can you spot the difference? The first output has no time zone information while the latter does. This means that when we converted a timestamptz we got back a timestamp, whereas when we converted a timestamp, it gave us a timestamptz. In other words, in the first example we converted an absolute time to a wall time whereas in the second example we did the inverse operation, i.e. we converted a wall time back to an absolute time. * When passing a time zone x and a value t of type timestamptz, i.e., timezone(x, t), I’m basically saying, give me the time the clock was showing in time zone x at the absolute point in time t.
* When passing a time zone x and a value t of type timestamp, I’m saying, give me the absolute time for when clocks in time zone x were showing t.
A day doesn’t always have 24 hours. As noted earlier, when daylight saving changes occur, the day can have 23 or 25 hours. What if you need to get all hours for any given day in a certain time zone, e.g. to calculate hourly statistics? This is where UTC or timestamptz helps us. This returns us 24 timestamps. What about days in which daylight saving changes occur? If we don’t take the time zone into account, PostgreSQL will always return 24 hours. Now, for June 1 this still returns 24 hours as expected. But what about March 13 and November 6? It returned 23 distinct hours for March 13 and 25 hours for November 6. With the hours printed in local time, it is easy to see at which point the daylight saving changes occurred. The only time we should be using timestamp over timestamptz is when the timestamp in question doesn’t denote an absolute point in time. I could only come up with one such scenario. Imagine a system with various customers where each customer is located in a different time zone. We might want to enqueue a task to run at a certain time, e.g. at midnight, local to each customer. In such a situation, the timestamp (e.g. 2017-01-01 00:00) would not denote a single point in time, but potentially a different one for each customer. With a customer’s time zone we are able to convert that timestamp to an absolute point in time for each customer given their respective time zone. Notice how each scripts.trigger_at of type timestamp resulted in a different timestamptz, namely one absolute point in time for each distinct time zone. Further, notice for Madrid and Los Angeles how midnight at Easter and midnight at New Year’s Day don’t result in the same UTC hour due to daylight saving. Timestamps in PostgreSQL can be confusing. But once you understand them, working with timestamps and time zones in PostgreSQL becomes a joy. I hope that this article convinced you of that. Finally, you might also be interested in learning more about using PostgreSQL on the command line. 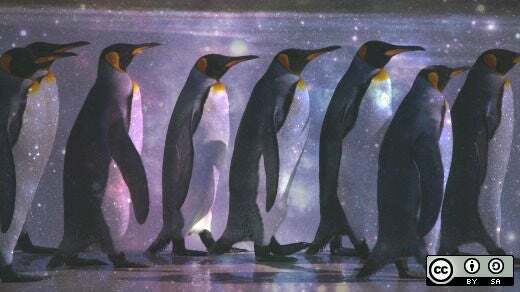 Solving the Year 2038 problem in the Linux kernel....Because of the way time is represented in Linux,a signed 32-bit number can't support times beyond January 19,2038 after 3:14:07 UTC.This Year 2038 (Y2038 or Y2K38) problem is about the time data type representation.The solution is to use 64-bit timestamps. How the quest to prevent time from running out led to all corners of the Linux kernel.